Home Nagashima Spa Land HUGE White Cyclone Coaster to become RMC. 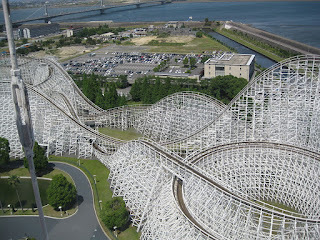 HUGE White Cyclone Coaster to become RMC. White Cyclone will close on January 28, 2018, for work to begin, with an expected opening in 2019. This ride is huge and long, as well as the first RMC we will see in a different color scheme. While Mean Streak was taller during its closure, the low angle of this lift hill leaves space for a lot of height to be added. It sure will be interesting to see what they choose to do with the drop. This coaster could very well reach the 200-foot mark if the money is there, but I would expect it to be under. With the ride featuring a lot of helixes, we can expect the length to be shortened quite significantly as we've seen on other RMC's. However, this is the longest wooden coaster outside the USA, so this should be one amazing ride no matter what they decide to do with all that height and wood! Check out the current POV of the ride below! I Imagine we'll see the helixes turn into something like the Iron Rattler helix, with a number of drops, unique air hills, and inversions, but cut shorter than the regular. Currently, the ride stands at a height of 139 feet with a top speed of 63mph. Mean Streak stood at 161 feet when it closed, with a top speed of 65mph.